"A simple two-ingredient glaze creates a browned crust on the pork and flavors the vegetables, too." Place pork roast in a large roasting pan and season liberally with salt and black pepper. Spread half the orange marmalade over the roast; mix the remaining marmalade with rosemary in a large bowl. Stir orange juice and olive oil into rosemary mixture. Combine parsnips and onions in another bowl. Add about 2 tablespoons orange marmalade mixture; toss to coat. Arrange vegetables around pork roast. Bake pork in preheated oven for 30 to 45 minutes. Pour remaining orange juice mixture over pork. Increase oven heat to 450 degrees F (230 degrees C) and continue to cook until pork is slightly pink in the center, 15 to 20 more minutes. An instant-read thermometer inserted into the center should read at least 145 degrees F (63 degrees C). Transfer roast to a cutting board and cover lightly with aluminum foil. Toss vegetables in pan juices and return roasting pan to oven. Continue cooking until juices have thickened and vegetables are browned, about 10 minutes more. 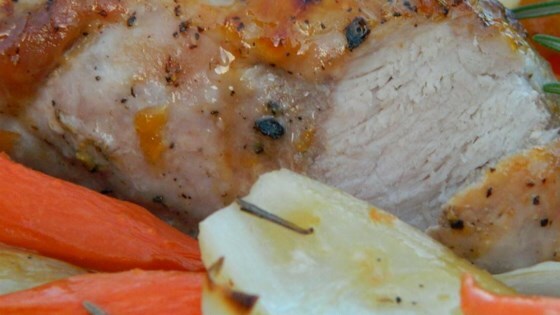 Slice pork and serve with vegetables and pan juices. Wonderfully moist - I used carrots instead of parsnips - they were so sweet. This was really good but I added red potatoes and carrots instead of parsnips. I also used dry rosemary because I didn’t have fresh. Everything should always have carrots! ? ?